Founded in 1887 by a group of 13 faithful, First Baptist Church of Redlands has served the Inland Empire region of Southern California for more than 125 years. The church’s current home, built in 1952, is beautiful Spanish-style building housing a sizeable 480-seat sanctuary. 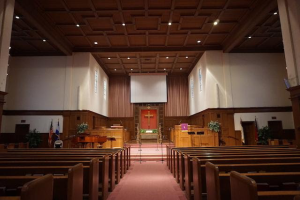 The room’s classic architecture creates problematic acoustics, however, and the congregation had struggled for years with poor intelligibility, exacerbated by an outdated center-cluster sound system. 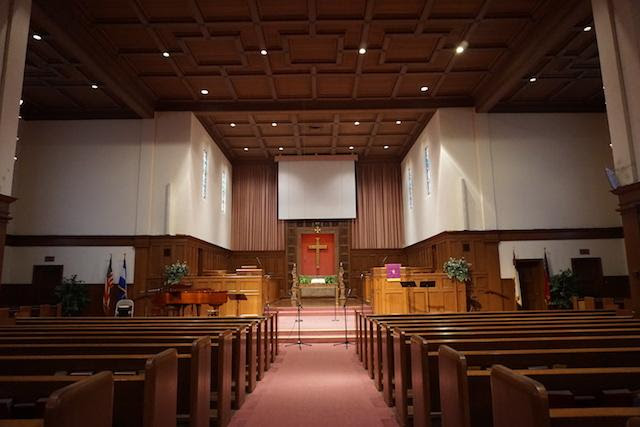 Those struggles recently ended with the installation of a new Renkus-Heinz Iconyx Gen5 sound system designed and installed by systems integrator Ireland Sound Systems of nearby Upland, California. Iconyx Gen5 is the fifth generation of digitally steered array technology from steerable sound pioneers Renkus-Heinz, offering a wider selection of configurations and even more precision than ever before. For the main front-of-house system, Ireland chose a pair of Iconyx IC16-RN digitally steerable line arrays, flown about 11 feet above the floor to the left and right of the stage. The IC16-RN is a powered, coaxial system that employs 16 low-frequency transducers, each with 3 tweeters, in a slim, low profile design. “One of the biggest reasons I chose the Iconyx Gen5 was the precise coverage,” Ireland explains. “The choir stands with the main loudspeakers just to their right and behind them, which I expected to be an issue. There was no way around placing the speakers there, but with the Iconyx beam steering, we had no feedback issues at all, which is amazing.” The low profile design of the Iconyx was an aesthetic benefit as well. “We had the enclosures custom-painted to match the decor, which turned out really nice,” he reports. Ireland considered steering a beam from the IC16-RNs to cover the balcony, as well, but ultimately elected to dedicate the front-of-house system to the main floor seating. To cover the balcony, he installed a pair of Renkus-Heinz CFX61 two-way loudspeakers. With a 150° x 60° coverage pattern, the CFX61’s complex conic design provides constant beam width and better pattern control over a wider frequency band than conventional horns. “We had the sound person keep the volume down on the balcony speakers so people could also hear some signal from the mains, and the combination worked very well,” notes Ireland.